The Karrier Ro-Railer, the name being a stylisation of 'Road-Rail Vehicle', UR 7924 seen here at Redbourn sometime in 1931 during trials prior to entering service between Blisworth and Stratford-upon-Avon. As far as is known, UR 7924 operated no advertised services on the branch from Harpenden and merely ran in paths between timetabled passenger and goods trains. Like a standard road vehicle gearbox, UR 7924 had only a single speed reverse gear and photographs of it on this branch show it facing in both directions so the vehicle's road/rail capability means it was likely turned in a goods yard by leaving and rejoining the rails, there being no turntable provision on the branch. Whether UR 7924 ran through to Hemel Hempsted is unclear. This photograph is obviously deliberately posed and the purpose of it would appear to be to show the retractable step which was deployed at railway platforms; when is use on the road entry and exit was via the normal, for the time, steps to and from ground level. Clear to see are the array of lamps for road or rail use. The two circular objects, one each side of the radiator, were for the mounting of a buffing bar which incorporated a small hook for towing purposes. The strength and usefulness of this item is open to question and most photographs of UR 7924 show the bar to be absent. The road registration number was issued in June 1931 in Hertfordshire. Mr J. Shearman, the LMS Road Motor Engineer, drew up the specification for the Ro-Railer and his department relocated to Wolverton, from Derby, in 1930 so quite why the vehicle was registered in Hertfordshire is unclear. The answer may be that the vehicle was procured via an agent based in that county. The chassis for the Ro-Railer was by Karrier Motors Ltd., Huddersfield, and based on Karrier's 'Chaser 6' design from their standard range of the time. The engine was a 6-cylinder petrol unit of 120bhp (37hp RAC rating) coupled to a manual gearbox with a form of overdrive. The vehicle attained a nominal 8mpg on road and 16mpg on rail - reasonable figures for the time. Calculated maximum speed was claimed to be 60mph on road and 75mph (70mph is also sometimes quoted) on rail but these figures should be viewed with caution. 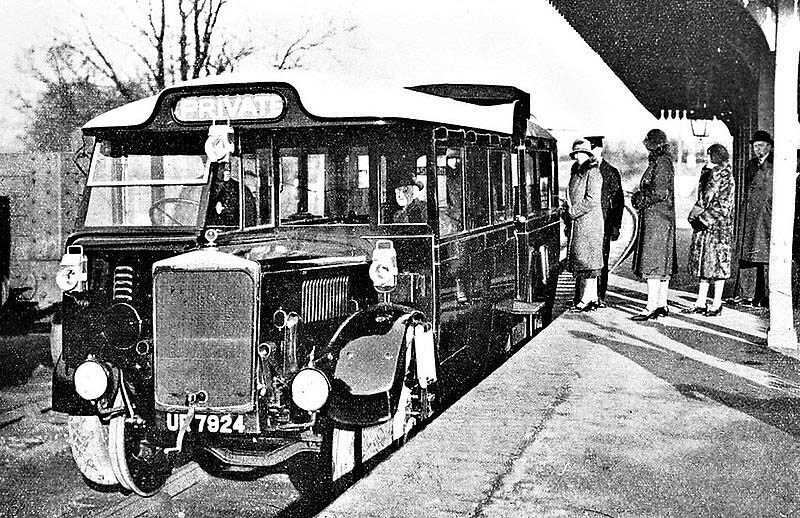 In any event the road speed limit for buses and coaches was, then, 30mph and it is unlikely the LMS would allow such a vehicle to travel on rails, in service, at anything even remotely approaching 75mph. The Ro-Railer's body was a sturdy affair built by Cravens Ltd. of Sheffield. Cravens were better known for their DMUs and other vehicles supplied to British Railways and for London Transport's A60/62 stock, but at one time were also builders of bus bodies. The Ro-Railer body seated 26 in two saloons, smoking and non smoking, separated by a vestibule. There was an entrance/exit door on each side of the body with the doors being situated at the top of the steps and within the body. Floor to ceiling height was 6ft 4½in along the centre line and the curve of the roof necessitated raised arches above each doorway to provide adequate headroom for passengers boarding or alighting at railway platforms. Other dimensions were length 26ft, width 7ft 5½in, overall height from road 9ft 9¾in, overall height from rail 9ft 6½in. Unladen weight in working order was 7tons 2cwt 2qr. The most novel aspect was of course the road or rail capability. As can be seen from the photograph, road and rail wheels were eccentric relative to each other when in rail mode but were concentric when in road mode. Changeover was achieved, manually and from outside the vehicle, by means of eccentrics which lowered one wheel and raised the other. It is said the changeover, which was carried out with passengers on board, could be achieved in no more than five minutes although one may suspect this figure was for publicity purposes rather than actual. Either way, changeover had to be effected at locations where rail heads were flush with the surface. A specially designed ramp, rarely seen in photographs, was also provided to aid alignment of rail wheels to rails. Steering was of course locked when the rail wheels were in use. It is said the rail wheels had wooden centres, intended to dampen vibrations, but by all accounts this idea was not particularly successful. Next to the Karrier stands ex-MR LMS Class 2P 4-4-0 No.556. The steam locomotive, which is coupled to a train of some description, was probably deliberately positioned for the photograph. Following trials, the Ro-Railer spent its dismally short service life running between Blisworth and the Welcombe Hotel, near Stratford-upon-Avon although there exists a story that on one occasion, in an emergency, it made a trip to Broom Junction and returned all the way back to Stratford in reverse. Whilst not impossible, the story should be treated with a degree of caution. The Welcombe Hotel began life in the 19th century as a country mansion, located at a semi-remote spot to the north-east of Stratford-upon-Avon. In 1928 the mansion's then owner died and the building was purchased by the LMS, extended and converted into an hotel which opened on 30 June 1931. Although long since out of railway ownership, the Welcombe is still trading today. Entering service on 23 April 1932 following a series of demonstration runs (it is unclear where these demonstration runs occurred but one assumes on the SMJct. line to and from Blisworth as the Ro-Railer had by then long since moved from the Hemel Hempsted branch) the vehicle's job was to take passengers to and from the hotel and Blisworth station, a quite lengthy journey in such a vehicle, connecting with trains to and from Euston. Often not realised is that Ro-Railer's changeover point was the goods yard of the long-since-closed Stratford Old Town station, not Stratford-upon-Avon's present ex-GWR station. Details of the journey in the Up (ie to Blisworth and Euston) journey have proved elusive but some details of the Down journey are known. At Blisworth Ro-Railer met the 4.35pm ex Euston train and reached Stratford Old Town at 7.10pm. Thereafter came the rail-to-road changeover in the goods yard, then the journey of around three miles to the Welcombe Hotel. It appears Ro-Railer also picked up and set down passengers in Stratford town centre as a record survives of an objection to this practice by the local bus company. A downside of the journey to and from London was the need for passengers to transfer on foot between the passenger station and goods yard at Blisworth, this inconvenience rather cancelling the convenience of passengers remaining on board during the mode change at Stratford. Ro-Railer was not based at any conventional railway depot but garaged overnight at the Welcombe Hotel where, presumably, routine maintenance was undertaken. Who drove Ro-Railer is a further unclear detail. When on rails it would have to be a train driver but on roads the driver would also be required to hold what was then known as a Hackney licence, later known as a PSV licence and today a PCV licence, as Ro-Railer carried fare-paying passengers. Were train drivers trained to also drive buses or were separate drivers holding the relevant qualifications used? The answer to this question remains elusive. Ro-Railer's time on the Welcombe Hotel service was short, the vehicle being withdrawn from service on 2 July 1932 following a major failure, believed concerning the front axle, the previous month. What became of Ro-Railer subsequently is unclear. It is known to have been taken to Wolverton and eventually scrapped but Board Minutes of the London, Midland & Scottish Railway show UR 7924 was relicensed for some time following withdrawal but why? We will probably never know. 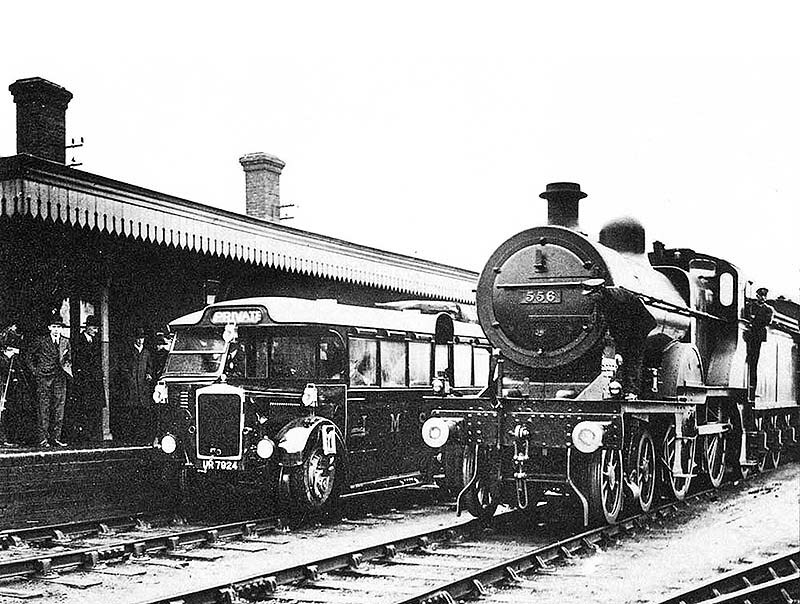 The service to the Welcombe Hotel reverted to its previous form, a steam locomotive and single carriage with conventional road transport between Stratford and the hotel. The LMS Ro-Railer was not the only such machine to emerge from Karrier's works. The firm also provided a road/rail flatbed lorry for the LNER, who used it for engineering purposes on the West Highland Line, and at least one passenger vehicle for Rotterdam Tramways, Netherlands. These vehicles carried a 'Road-Rail' badge on their radiators but this adornment appears to have never been applied to the LMS vehicle. The use by the railways of what were in reality adapted road vehicles was never particularly successful, largely because road vehicle designs are not rugged enough to cope with the rigours of railway use. Nevertheless a few such vehicles, converted to rail-only form, can still be seen in far-flung corners of the world and of course road/rail plant is today a common sight on railway engineering projects. The latter are entirely successful due to their intermittent and very low speed usage, with their small rail wheels being used only for guidance as opposed to traction purposes.